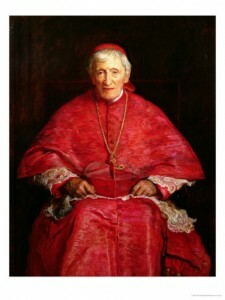 Newman describes the virtue of detachment as a pure, self-less service of God which he considers the characteristic common to most popes. While praising this selflessness, Newman notes that although they are old men they have been open to new lines of action when it has seemed needed. He returns to the example of St. Gregory, the Great who having enough troubles of his own looked to the future of the Church and the preservation of learning from the quarter least expected. St. Gregory (540-604) rejoiced with the news from Augustine of the reception of the faith in England. He told Queen Bertha and Ethelbert King of Kent how their conversion brought great joy to the See of Peter and to the Imperial Court of Constantinople. In a letter to Patriarch Eulogius, who had told Gregory of the winning of heretics in Alexandria, Gregory spoke of the conversion of the English as comparable to that of educated and wealthy persons won over by Eulogius. In 668, Pope Vitalian, who followed closely the ecclesiastical affairs of England, consecrated Theodore of Tarsus, a highly educated monk living in Rome for the see of Canterbury. He wished to unite the people of England and maintain a close tie with Rome. The Pope sent with him Adrian, another learned monk to be the head of the monastery at Canterbury. Newman writes how “Passing through France, in their way to their post of duty, they delayed there a while at the command of the Pope, to accustom themselves to the manners of the North; and at length they made their appearance in England, with a collection of books, Greek classics, and Gregorian chants, and whatever other subjects of study may be considered to fill up the interval between those two.” These men founded schools for both secular and sacred learning in the south of England. According to Newman, men taunt the figure of the Pope: “He inherits the earth, but is not certain of a roof to sleep under, or a grave to be buried in. How is he better off, because his name is mentioned in Mass in the Brazils, and his briefs are read in the Churches of Cochin China?” Men would think the Popes of the seventh century would have fallen back on Constantinople and reached some agreement with the Imperial Court, and left the Barbarians to their own fate. Instead, the Pope thought of the Church rather than himself. Also in his time Newman saw this “heroic detachment of Popes” when Pius IX was exiled to Gaeta (1849). This characteristic behavior of Popes has had profound influence on many aspects of the spiritual and moral lives of peoples; as Newman indicated, one of these aspects is the field of education with the preservation and transmission of learning.